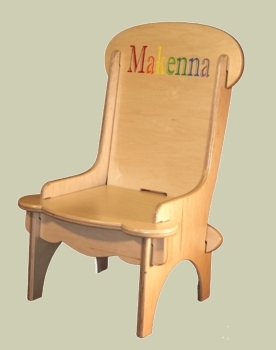 Made from durable maple hardwood, this sturdy child’s chair measures 28 inches tall by 17 inches wide. It arrives un-assembled but is easily put together with no tools or added hardware required. The child’s name is artfully engraved on the front (maximum of 11 letters) and then hand painted in primary colors. A personal message can be engraved on the back as well. See More Images for more pictures of this product.